What does this all mean, well not much I think as the changes only occur at best in about 25% of pwMS, but I think 2017 is going to be the year of the B cell as ocrelizumab hopefully gets a licence for treatment of MS, either that or rituximab use develops. I have an open letter to MD and professor Gavin G.
For some reason, you underestimate the risks with Ocrelizumab – it is far to much blue sky (sorry) opinions aired about this, to my view, risky MS-agent. Apart from all these cancer cases in the ORATORIO / PPMS trial (2.3% vs 0.8%) and also worrying 6 cases of breast cancer vs 0 in placebo – if you include the RRMS trial (Opera I/Opera II), it would be good to look at the history of this Ocrelizumab – its footprints in the past. There were 6 deaths associated with infections in the RA phase III trial. Furthermore, there were 5 deaths associated with serious infections in the Lupus phase III trial. Both studies were halted due to these deaths using Ocrelizumab. On of the few that really highlights the risks with this Ocrelizumab is this professor Mark Freedman, who, for instance, did this statement at an interview at Ectrims 2015. 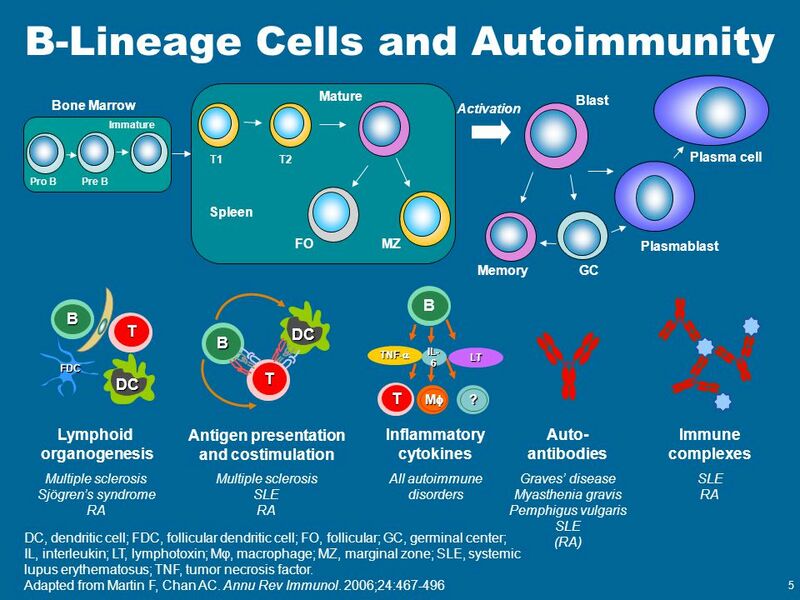 Given Ocrelizumabs history, I think it is about time to acknowledge that this agent comes with great risks, given its bad safety footprints both in previous studies in RA and Lupus, and now lastly in MS – referring then firstly to all these malignancies. Yes it appears to have a good efficacy towards halting relapses, but at what cost ? Roche wants of course to market this agent for a broad patient population to earn money. That is only natural wish for a business company. But to my opinion, use of Ocrelizumab could only be an option for patients who is willing to take the risks and have highly active MS-disease. And as professor Mark Freedman states in the above interview, what will happen in the long run when you suppress or deplete the B-cells so heavily as ocrelizumab doses …? I just wish that we could have a more balanced discussion about risks and benefits. So far, to much of the debate is focused on the positive effects, but not so much is mentioned about Ocrelizumabs (OCREVUS) risks. Professor Mark Freedman is one of the few that stands up and air a more balanced view on risks and benefits with regard to this Ocrevus (Ocrelizumab). I hope you will have the courage to publish the above. Please explain this post a little more. What is the main point ? "… the changes only occur at best in about 25% of pwMS" : What changes? These cells only appear in about 9 of 40 peopleb so a minority. This was an excuse to start talking about B cells. I predict 2017 is going to be the year of the B cell as ocrevus gets a licence for RRMS, not sure what will happen with PPMS,. However it is important to realise that they are not amorphous and there are many subpopulations doing different things.